These nighttime satellite images show Puerto Rico's largest city, San Juan, before and after Hurricane Maria made landfall on Sept. 20. The images capture areas where residents have lost power; emergency responders can use the pictures. A NASA/NOAA satellite captured nighttime images of Puerto Rico last week, revealing regions on the territory that are without power, due to Hurricane Maria. The images show Puerto Rico's major cities lit up by human activity before the storm's arrival on Sept. 20. But composite images taken on Sept. 27 and Sept. 28 show the drastic reduction in human-produced lights due to nation-wide power outages. The images were taken with the Visible Infrared Imaging Radiometer Suite (VIIRS) instrument on the Suomi National Polar-orbiting Partnership satellite, which is jointly operated by NASA and the National Oceanic and Atmospheric Administration (NOAA). The territory of Puerto Rico, imaged at night before the arrival of Hurricane Maria (top) and after, by the NASA/NOAA Suomi satellite. In the after image, the southeast and western regions of the territory are somewhat obscured by clouds. The satellite captured the images using its "day-night band," which detects light from a wide range of sources, including things like lightning, but also human activity, according to a second NASA blog post. The images are "processed and corrected … to filter out stray light from the moon, fires, airglow and any other sources that are not electric lights." The images showing Puerto Rico before Maria were created using observations taken over many nights, in order to cut out cloud cover. In the images compiled over the nights of Sept. 27 and 28, cloud cover affects some areas, including the southeast and western portions of the island. But the images show clearly the loss of power in the island's biggest city, San Juan. NASA scientists overlaid the satellite observations onto a base map that shows streets and neighborhoods, providing first responders with more-specific information about the locations of power outages. The base map utilized data from four additional satellites. Satellite images from NOAA show Puerto Rico at night, both before (above) and after the arrival of Hurricane Maria. 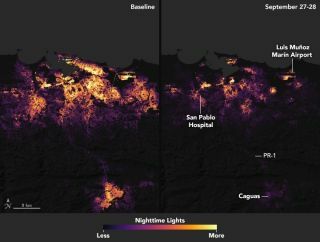 On Sept. 25, NOAA tweeted an additional before-and-after satellite image of Puerto Rico at night. The images provide a glimpse at the extensive loss of power throughout the island. NOAA representatives did not say whether the images had been processed, and whether all of the light shown in the images is human-produced. Over 1,000 people are believed to have died in Puerto Rico because of the storm, although some estimates place that number closer to 2,000. Because Puerto Rico is an unincorporated U.S. territory, it is entitled to U.S. federal emergency aid. FEMA is currently responding to the disaster, but restoring power in Puerto Rico could take months.